Howdy folks! Thanks for coming back to 60 to 100, the articles where we transform a 60-card archetype into a deck fit for 100-card singleton commandering. 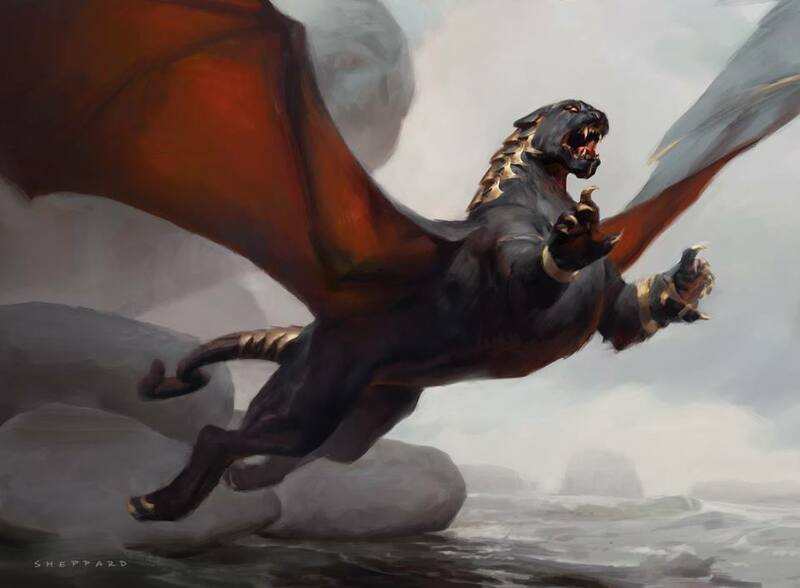 This week we take another request from a reader to cover the casual favorite Dragon Stompy deck. So, since we did just get our new tribal decks in Commander 2017 and there looks to be some awesome fatties coming out with all the Ixalan spoilers we’ve had coming out this week it seemed like a great chance to go over a casual favorite archetype. As you can see from the decklist, Dragon Stompy is all about blowing up the world and then beating down with a big fat threat that is hard to interact with. Board wipes like Bonfire of the Damned and Fiery Confluence work away at the opponents until Thundermaw Hellkite or the like finish off the job quickly. 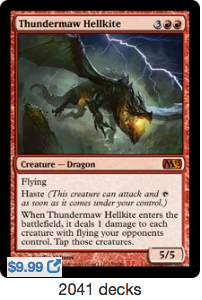 We can’t really count on just one creature to finish the job in Commander though, so now we need to amp up our threats! 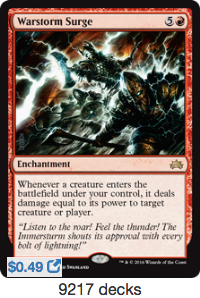 So how do we make a red-centric deck work in Commander? Red has the reputation for being the worst color in the format (fairly or unfairly) so unless we plan on burning the opponents out with big fat X-spells, we’re going to need to add some other colors to the deck. Red helps us burst out the gates but adding a bit of diversity is always a good thing to help us be a little more diverse. 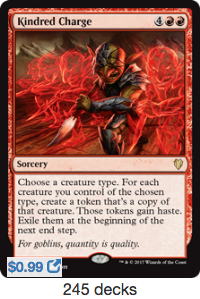 Since red, black and green decks (Jund for those in the know) have been the dragon colors of choice for as long as Karrthus, Tyrant of Jund has been around. While he would be a great leader for this beat down deck, Dragon Stompy is a little more punishing of a deck and we need a commander to suit that. Hey…I think I have an idea for that…. She was a cat, I mean she was a dragon, I mean she was a dragon cat but she was still WASITORAAAAAAAAA! Yea that one! An evasive commander that can keep the board clear and if we build around her right, can slowly grind out value over the game like the 60-card stompy decks want to do. 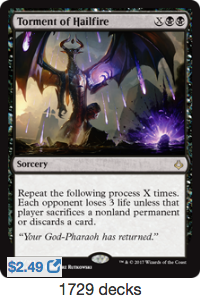 A little bit of removal, an evasive threat that is good at getting in damage every turn, REALLY good with extra combat steps…yup. This is fine! 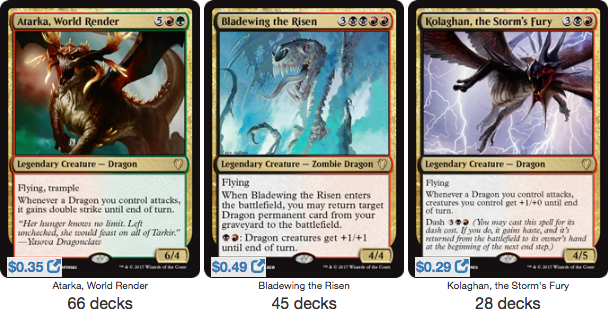 As I have mentioned over the course of this series, one of the biggest differences between 60-card decks and 100-card decks is that in Commander we need our spells to be much…bigger. 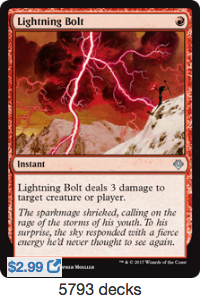 Lightning Bolt may be awesome when your opponent only has 20 life and you only have one opponent, but since everyone has 40 life and usually you have to deal with more than one other player, it turns underwhelming really quick. Our 1-for-1 removal needs to stay at a minimum and instead get some bigger effects for each card. 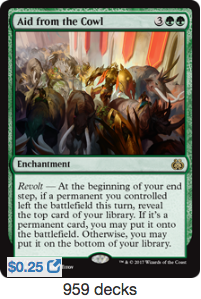 Stompy decks make a living off making things hard for opponents, which includes keeping creatures on the battlefield. 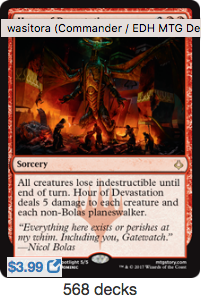 Dragon decks are just naturally gifted at playing creatures that are bigger than the opponents’, so cards like Warstorm Surge and the new Hour of Devastation mean we’re going to be ok dealing lots of damage-based boardwipes. And of course, it wouldn’t be a black deck by Matt Morgan without Torment of Hailfire lately. 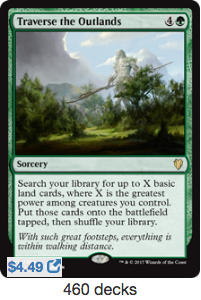 This card is SOOOOOOOOOO fantastic at running opponents out of resources that it’s probably irresponsible. Well, irresponsible might be the wrong word, but it’s crazy good and every black deck should probably run it from here to eternity. One of my newer favorite cards for decks with a high average converted mana cost lately has been Aid From the Cowl. This card is great with any deck that has dispensable resources. 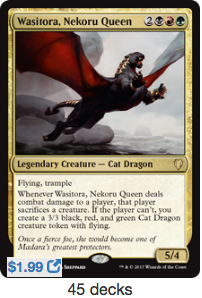 If we have some extra cat tokens from Wasitora we can suicide them in to trigger it. Curse of Opulence gives us a free artifact to sacrifice as well. In a deck that’s about getting ahead in the most fair of ways, Aid from the Cowl might be one of the more enjoyable crapshoots in recent memory. While we’re in the mood for big effects with big creatures, Commander 2017 didn’t just bring us our commander for this adventure, it brought a couple fancy big spells to battle with too! Traverse the Outlands is one of the biggest and splashiest ramps spells you’ll ever find. Want to grab 5+ basics all at once? Here you go! And don’t forget about Kindred Charge while we’re at it. Need a way to finish off everyone else at the table but don’t want to play the same old Insurrection? Check and mate. Both of these cards are super fun and are great ways at going over the top of the rest of the table. When you don’t have to stick to 2-cmc spells, you get to have way more fun. Let’s take a look at what we’ve finally constructed here! Archfiend of Depravity may not be an actual dragon, but he definitely gets honorary status. Keeping opponents with minimal creatures on the board means that Wasitora is going to be able to do even more work, and I do love powering up my most consistent threat in games. Aggravated Assault and Hellkite Charger pair crazy well with Wasitora, who loves being able to connect multiple times per turn. If there was a dragon that you could make in the voltron/damage triggers out there Wasitora would be the best one in my eyes. These additions are a shoutout to that playstyle if you wanted a couple ideas to push you that way. Elemental Bond has been one of my favorite draw engines for green for a while, so I’m glad to see it appearing in Commander 2017 again. It’s such an underrated card that can chain together some very good turns once any deck gets establish. Play it and love it for yourself! What do you think of our final concoction? Is it something worth giving a shot or did we miss the mark on a few things? Let me know your thoughts in the comments along with any more suggestions for 60-card decks we can apply to the 100-card format. Next week I am planning on having a little bit of a departure from our 60 to 100 series and have something special for all you readers with the new Commander 2017 decks. Stay tuned for that too!